I woke up recently and my beloved cell phone had a message for me. It said, “$#$@ you.” Then it rolled over and died. For good. I tried performing CPR but it was too late. I LOVED my old cell phone. It let me call people. It let me text people. That was it. That’s all I wanted. I didn’t ask much and we had a great relationship. #1– I can’t answer the damn thing: So, I’m on my phone, trying to figure out Words With Friends (especially hard when you have no friends) and my phone starts ringing. I’m pushing all kinds of buttons, trying to slide the screen, whatever it takes. Nothing. Can’t figure out how to answer the *%**#@ phone. #2–The sticky screen: You’d think I sweat maple syrup from my fingers. Either that, or I have a serious ear wax problem that’s gone undiagnosed for years. My phone’s screen is constantly attracting stickiness. And if I try to clean the screen, I turn on all kinds of apps that I had no intention of opening. Or I call China. #3–The keyboard: I never realized my fingertips were so freaking huge. I take my cucumber-size fingers, and dumbly punch at numbers on my phone (leaving a sticky residue), and never quite spelling out texts the way I’d like. I’m sick of typing, “Wher ar your meettinh mr?” Or sending half-finished texts because I accidentally hit send. 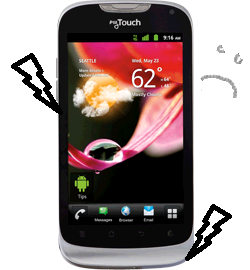 #4–The ultra-sensitive screen: Only teenage girls are more sensitive than my phone. If I’m trying to tap a specific app (see “cucumber-size fingers”), I’ll punch everything around it, bringing up all kinds of garbage. Or, I’ll push directly on the button–and it lights up, meaning, yes, it was tapped. No response. Just a slow b-l-i-n-k as the phone shuts itself off. And I often find that my cheek is playing Angry Birds while I’m trying to talk to my sister. #5–No charge: No, I don’t mean my phone was free. I mean my phone goes through power like a Kardashian goes through plastic surgeons. My phone holds a charge like Lindsey Lohan holds her liquor. Not well. 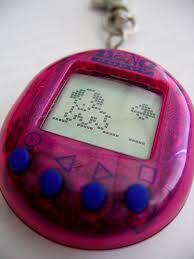 I feel like I’ve purchased a ’90s Giga-Pet that needs to fed, loved and nurtured 24/7. 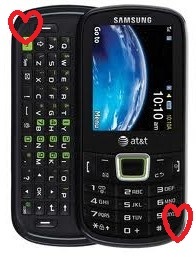 Maybe one day, I’ll fall in love with my phone. Maybe one day, my phone will accidentally fly off the nearest overpass. Maye one day, I’ll just take my big fingers and buy a rotary phone. Well, I am usually behind with getting the latest gadget. Though I have a cell phone, I am not the typical user, keeping it in my purse and using for long distance, preferring my land-line. (Oh, and to add, I never jumped on the texting bandwagon… there is just not a demand for it in my life, I am not a kid and I don’t have many to keep connected to, let alone to share my whereabouts or ask theirs). One day, I was with my sister and she and I decided maybe it was time for me to switch over, however, I didn’t know what I was getting into. I suppose I just thought it would be nice to have a “touch” feature, thinking it would make it quicker to navigate around. Right. Though, there have been urgings by others to stick with it, I’ve decided, “what for?” and want to return the thing before it may become damaged. So, I won’t be playing with the big kids, it won’t ruin my life. Frankly, I think it is pathetic that the demand has become to adapt to something pretty unnecessary in order to be thought of as acceptable and functional in society, when society has become robotic and less communicative overall. I just need to add to my original comment that after I contacted the store (AT&T) in regards to returning the phone, I was told there would be a $35.00 “restocking fee”.. absurd. So, I am not bothering with that and will keep the stupid phone, but for now, will continue to use my original phone and can attempt to use the newer one again. None of this makes me happy. Have gone back to my c115 tonight. I detest my smart phone. I have a PC, a laptop, an iPad. What in Gods name do I need a smart phone for. I forgot I have a smart t.v. too. I made the right decision to night. The monster is relegated to the bottom drawer. Maybe one day you will learn to use the darn thing. I got the thing and I hate it. I have an old phone, by everyone else’s standards, but it is these stories that make me loathe the thought of switching. Sure, there are all sorts of promises that the change will be “seamless” but I find that to be a load of crap. Hold out as long as you can!!! This would be even more hilarious if it were not so true. . .all my husband wants is a phone that makes and receives calls. He is very low-tech and doesn’t want a camera or any other thing. He told me, ‘It’s a freakin’ phone, not a camera, not a computer. . .etc.” He has the same size fingers by the way. He still has trouble picking up texts and pics when sent to him. Poor guy – he just doesn’t want to deal with it. I am on the other end of the spectrum. I love all this stuff. . .but NOT your phone. I would find a way to send it sailing. Good post, thanks for the laughs even if they were at your expense. I feel your husband’s pain. I’m not techie enough to appreciate all my phone does.